Superlative balance. Great complexity, very good nuance. Softly textured accomplished sans a creamy muffling -- tho cream is present and toasted. Rich, savory, with a weighty body. Bittersweet draw and sweetbitter lingering finish with a great set a' legs. Non-acidic and zilch bite. Quite aromatic room-note, sweet and warmly spiced. Strength uniformly increases throughout and never wallops. Mouth-feel is a bit toward damp, but never spitty. Profile moistens with progression, but never gets bogged down nor mottled. Warmly toasted woods both hard and cedar, and spiced cocoa. Then a dark bread, rye malt attachment. Dark fruits, ripe and wet. Espresso made sweet with an accompanying molasses. Smoky. Cream. Toasty. Finely ground black pepper particularly on retro-hale... travels with a nice salted buttery note... saute. Applejack -- not Apple Jacks -- Applejack. Potpourri. Berry. A certain booziness. BBQ. Leather oils. Barnyard. Grain. Candied almond slices on finish. Not exotic, but not generic, red kitchen spices with an herbal quality... gourmet Americana. Pack softens noticeably off burn and then throughout, but seams and draw aren't affected. Although at times draw expresses a tick of a lag on its own. Supple leather hand-feel. Ash is flaky and prone to cracking, but a nice very pale grey with a silver tick here and there. Smoke out-put is somewhat helter-skelter as to volume on each end. Fails to, at times, satiate smoke-hole fully. Lends to a rustic assemblage which seems germane and not missteps per se. Burn is never exceptionally even and requires a couple retouches in a shorter than average format. Blisters once. 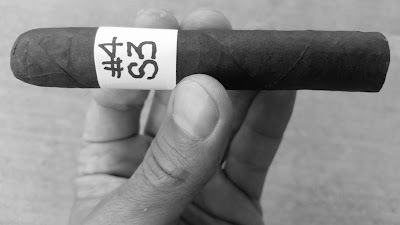 Speaking to the shorter format, a very nice pacing which offers a very decent smoke time. Draw and shaft warm up at the band, nicely so.